On Thursday, July 9, Principal Investigator Arnold conducted a fathometer survey of the Denbigh wreck site in conjunction with Captain Scott Hickman of Circle H Outfitters. The fathometer data showed that Denbigh lies very flat bottom, sloping gradually to the south. A contour map (top) and three-dimensional representation of the area around the Denbigh wreck site. The actual depths shown vary from 4.8 to 8.1 feet (1.5m to 2.5m); the vertical dimension is greatly exagerrated in the 3D view to show contour clearly. Over July 10-12, Investigators Arnold and Hall, assisted by Southwest Underwater Archaeological Society members Austin and Sue Taylor, Winton Roberds and John Melko, continued mapping the central portion of the wreck site, particularly in the area around the exposed boiler casing and sidewheel frames. The crew experienced significant difficulties in obtaining accurate measurements due to high winds, which created a significant chop on the surface of the water, and a continual swell below. 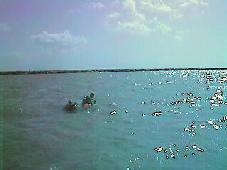 Water visibility on Saturday and Sunday was estimated to be 6 inches or less. outlines the objectives for a dive. SUAS volunteer divers examine Denbigh's exposed machinery. 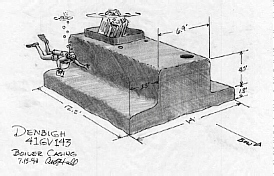 Concept drawing of Denbigh's exposed boiler casing. 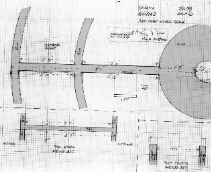 Drawing of sidewheel frame details. In addition, on Friday and Sunday the project hosted personnel from KHOU-TV Channel 11 in Houston, which obtained footage of the wreck both from the surface and underwater. 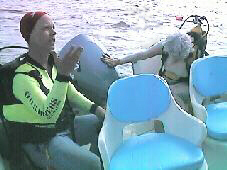 The resulting feature story appeared on KHOU's news broadcasts on Sunday at 5:30 and 10 p.m., and on the following Monday at 7 a.m.
Special thanks to Tom's Dive and Ski of Austin, which provided dive gear; SUAS volunteers Sue and Austin Taylor, Winton Roberds and John Melko, who provided boats, dive gear and themselves; and Capt. Scott Hickman of Circle H Outfitters, which provided the survey vessel at a concessionary price.